LEVERINGSTID CA. 10-12 DAGE FRA BESTILLING. Sold as a complete three-piece set including solo, removable driver backrest and matching passenger seat. The deeply pocketed front bucket measures a full 17" across and can be run as a solo. The passenger seat extends forward to provide additional driver back support. Passenger seats are 13" wide and utilize internal steel support wings for all day comfort--your passenger will be happy. Mustang's engineers have designed the Road Star seat to close tolerances for a perfectly tight fit. 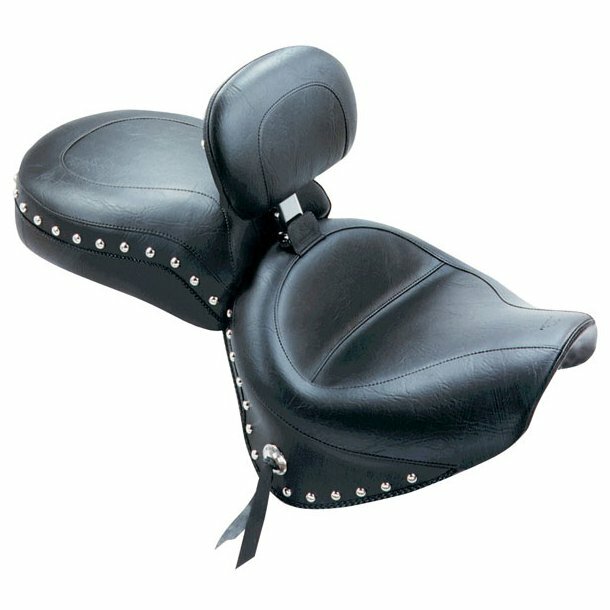 The built-in driver backrest offers more features than any other backrest on the market.